The Z1 Analyzer has various features available to commercial users. This tab of the settings dialog allows the commercial user to customize those settings. Commercial users may assign a password to any uploaded lap file. If this is done then only other commercial users who know that password can download the lap file. This enabled easy sharing of lap files between specific users. If you want to download a password protected lap file then you will need to enter the password here. With this option selected you will see all non-password protected laps as well as those that are password protected. You can use this option to filter the list down to just those laps with a password by un-selecting it. When the traces are drawn they need to know the maximum and minimum values, or extents, of the graph. With this option selected those values will be calculated on the fly from the live telemetry data. If you have a base lap loaded then unchecking this option will tell the Analyzer to use the base lap's data to determine the maximum and minimum extents for each graph. This will produce faster redraws than using the live data's extents. If you have a base lap loaded then with this option checked thast base lap will remain loaded when you start live telemetry. 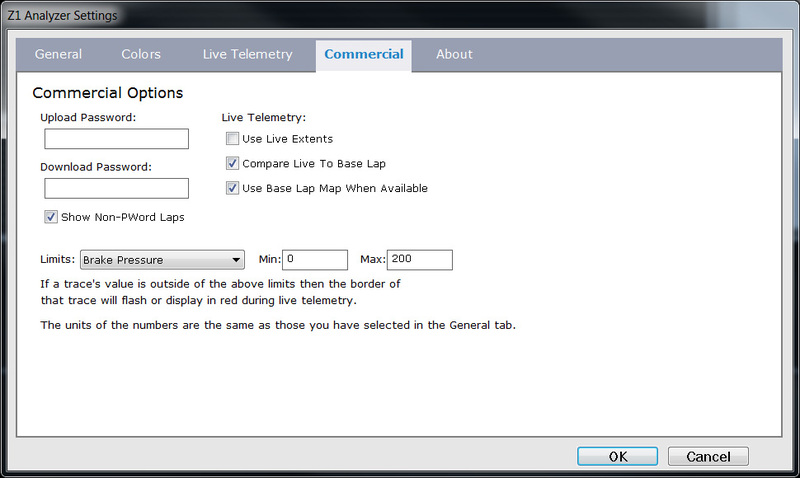 This allows you to compare the live telemetry to the pre-recorded base lap telemetry. If you have a base lap loaded then selecting this option will use the data in that base lap to create the track map. If this option is not selected or a base lap is not loaded then you will have to have created and saved a track map for this track in order to see one during live telemetry play back. As a commercial user you can have the border of a trace flash during live telemetry if the value of the data displayed within the trace exceed predefined limits. You can defined the maximum and minimum limits for all the standard data channels by selecting the desired channel and then entering the maximum and minimum value. The units for the entered values correspond to those used in the trace. For example if the trace is displaying KPH, then the values entered are taken to be KPH values.